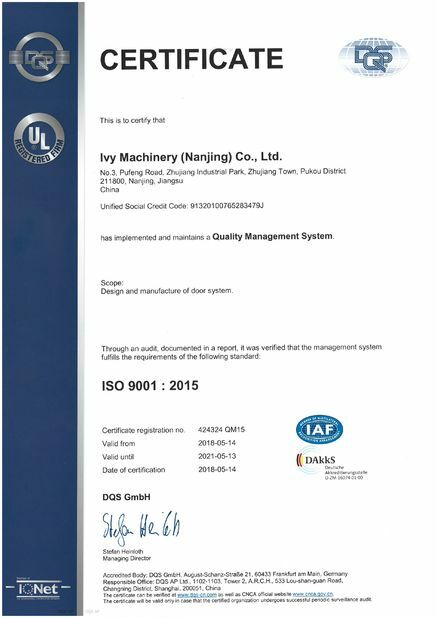 Had cooperate with IVY for nearly ten years, always satisfied with their products and services. Platform screen doors (PSDs) at train or subway stations screen the platform from the train. They are a relatively new addition to many metro systems around the world; some having been retrofitted to established systems. 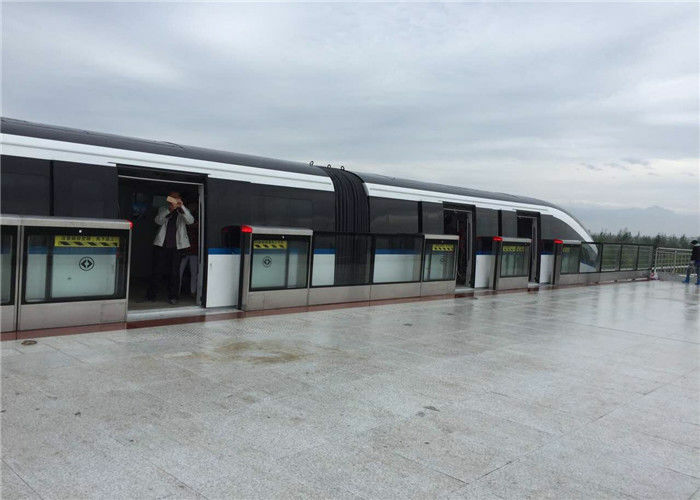 They are widely used in Asian and European metro systems. The platform doors slide open or closed simultaneously with the train doors. Prevent accidental falls off the platform onto the lower track area, suicide attempts and homicides by pushing. Reduce the risk of accidents, especially from service trains passing through the station at high speeds. Improve climate control within the station (heating, ventilation, and air conditioning are more effective when the station is physically isolated from the tunnel). Improve security - access to the tracks and tunnels is restricted. Lower costs - eliminate the need for motormen or conductors when used in conjunction with Automatic Train Operation, thereby reducing manpower costs. Prevent litter build up on the track which can be a fire risk. 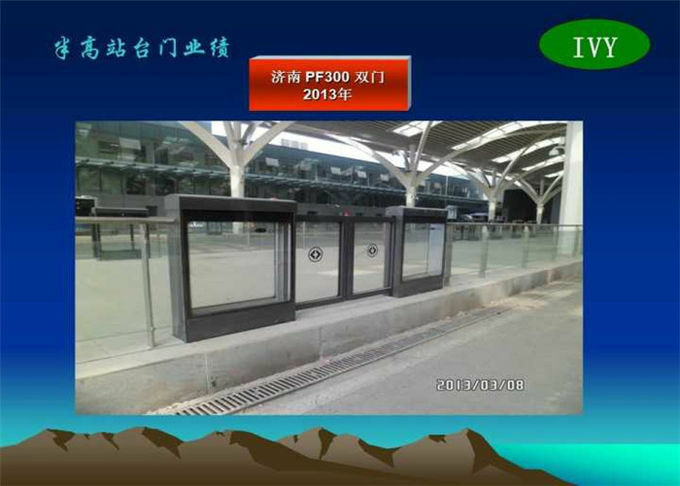 PF400 Platform screen door is developed by Ivy Machinery based on North America rail sliding door technology combining with Chinese metro system environment. The design philosophy is to build simple, reliable, Environmental, and energy saving system. Normal operation mode After the train parks within the required range, ATC system will give door opening or closing order to the central control cabinet (PSC). Then PSC gives order to individual DCU to implement the door opening and closing. System Failure Mode In case the system control fails, the station operator can open and close the platform door using the control panel in the station control room. Door Unit Failure mode If the individual door has mechanical or electrical problem, the platform operator can open and close door by using local key. PF400 Platform screen door consists of Mechanical & Electrical system. Mechanical system includes frame structure, door operator, sliding door, fixed door, emergency door, and end door. ; Electrical system includes power supply, door control unit (DCU), central control cabinet (PSC), & network connection equipments. The door operator consists of driving mechanism, hanging mechanism, guiding mechanism, and locking & unlocking mechanism. Guiding mechanism consists of lower guide roller and track. When the door panel moves, the roller installed on the low part of door panel will rotate around the guide track. The lower guide track is installed on the structure frame. Central control Cabinet (PSC) consists of central logic control (PEDC) and monitoring system (MMS). The CAN based technology is used to connect the PSC and DCU. The best chip in the world and imported other key components to ensure the high reliability. 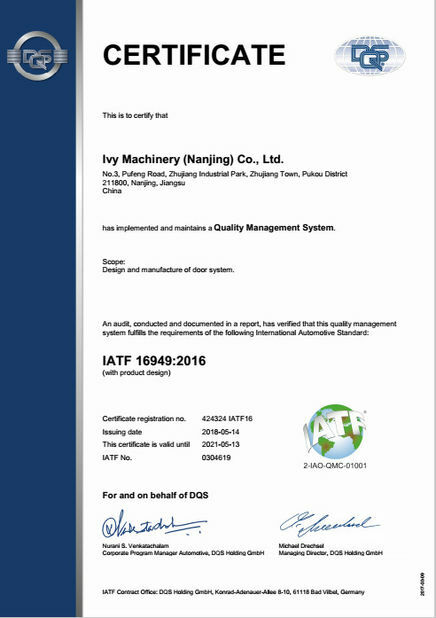 Ivy Machinery (Nanjing) Co., Ltd.
China Good Quality Pneumatic Bus Door Systems Supplier. Copyright © 2018 - 2019 busdoorsystems.com. All Rights Reserved.